Low prices. 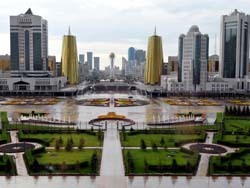 OrangeSmile.com offers car hire service in Kazakhstan on the lowest-rate-guarantee basis, since we work with car suppliers directly. For your search criteria in Kazakhstan, we always select and show the best rental offers. The car reservation process consists of 3 simple steps: (1) search for available cars for your dates in Kazakhstan; (2) select your car type; and (3) fill in the booking forms. Once the reservation is completed, you will receive a confirmation voucher to your email address. During the booking process, please check your rental conditions. To pick up your car at the rental point in Kazakhstan, you need to provide our confirmation voucher, your driving license and a valid credit card. The final payment is normally carried out at the pick-up point. Our car hire points in Kazakhstan accept VISA, MasterCard, etc - please check your rental conditions. At the pick-up point, please read the handling manual and check the car for present defects. OrangeSmile.com wishes you a pleasant journey to Kazakhstan! The car hire reservation system OrangeSmile.com allows renting a vehicle in Kazakhstan within 10 minutes. Our largest database of car suppliers enables us to provide you a rental car in Kazakhstan at the cheapest rate ever possible. At rental locations in Kazakhstan we offer the following car sizes: mini, compact, economy, standard, premium and luxury. The following car types are available in Kazakhstan: Sedan, Hatchback, Jeep, Cabriolet, Coupe, Minivan and Minibus. A country of great steeps, Kazakhstan never ceases to amaze its guests with numerous wonders of nature, fascinating places and unique culture. When describing the most interesting places in Kazakhstan, the city of Almaty should be mentioned first. The city is widely known for its spectacular architecture, spacious parks and modern entertainment centres. Panfilov Park is a favourite place of rest for both citizens and guests of Almaty. The park is also the location of an architectural landmark – Zenkov Cathedral. Almost all buildings of the Russian Empire period were destroyed by a devastating earthquake that happened in 1911. The cathedral was one of a few surviving buildings and it’s a true miracle given that the fragile building is made of wood. The Central State Museum is considered the largest cultural centre in the country. The museum exhibits collections of archaeological and historical findings. The modern capital of the country, Astana, is no less beautiful. The city is home to several important landmarks, such as one of the oldest universities in Kazakhstan, which was named after L. Gumilev. The university is surrounded by a big park, two theatres and several museums. The ancient city of Turkistan is an important tourist destination because of one prominent landmark. This is Mausoleum of Khwaja Ahmad Yasavi, which is famous far beyond the borders of the country. There are several important sights in the piedmont region of the country, such as Tanbaly famous for the ancient art on the rocks. The drawings made during the prehistoric era feature animals, hunting scenes and newer drawings depict Buddhist symbols. Tanbaly is also famous for its picturesque fairs, where tourists can buy various goods, from national pastries to souvenirs. Fans of nature landmarks should consider visiting Trans-Ili Alatau. This is a unique national park with magnificent mountains, giant glaciers, beautiful valleys and lakes. Popular excursion routes were made on mountain slopes, across fast streams and flower fields. Alpinists will be pleased to conquer Khan Tengri Peak that was named one of the most beautiful mountains in the world. Khan Tengri was chosen the location of an annual sports festival that gathers extreme sports masters from all over the world. Kolsay Lakes feature a truly breath-taking view. These three crystal clear lakes are filled with water from glaciers. The lakes are surrounded by dense forest and can be reached by foot. Travellers can also see the lakes from the bird’s eye view and make an excursion in a helicopter. When traveling in a group, consider a minivan option - it will be cheaper than renting a couple of standard-size cars. Please note that in Kazakhstan vehicles with more than eight seats require a special type of driving license.